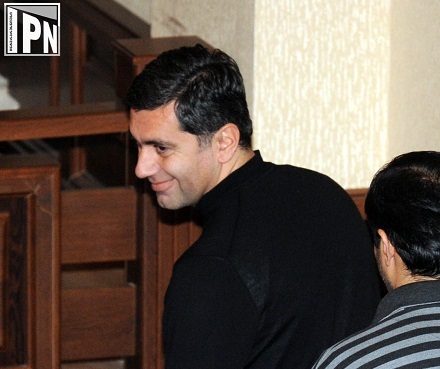 TBILISI, DFWatch — The court hearing for former Defense Minister Irakli Okruashvili was postponed till December 3 at the request of his lawyers. Okruashvili served as minister in Saakashvili’s government, but left in 2007 and has since been living in France, where he has political asylum. In 2008, a court sentenced him in absentia to eleven years in jail. This morning he returned to Georgia and was detained at the airport. The former defense minister who stood at the center of events during the turbulent fall of 2007 was brought to Gldani prison in Tbilisi, while the court hearing in his case was scheduled same day on Tuesday. His lawyers asked the judge, Khatuna Kharchilava, to postpone the hearing, considering that most of them became involved in the case recently and need time to read up on all the details. The main charge against Irakli Okruashvili is an attempt to form armed units together with several persons, a charge he denies. The former defense minister, who grew up in, or near, breakaway South Ossetia, attended the session today. His family, friends and supporters came to listen to the proceedings and applauded him when he entered the courtroom. Due to the great public interest, the judge allowed the first two minutes of the proceedings to be recorded on video. Members of a monitoring group, which until January have been allowed to enter any prison any time, visited him in the cell at Gldani prison. He told them that the investigation against him is regarding six incidents. Irakli Okruashvili says almost all cases are suspended, except the one which led to an eleven year sentence. He says he plans to fight in court and appeal the eleven year sentence. He refuses having had conversation with any of the new government officials and considers that his return wouldn’t have been unexpected.